A team of scientists has discovered the fossil of a 305 million-year-old arachnid, revealing more about the early origins of modern-day spiders. The new species, named Idmonarachne brasieri in honor of Professor Martin Brasier, University of Oxford, who passed away in December 2014, was found in Montceau-les-Mines, France, and researchers from The University of Manchester, Berlin’s Museum für Naturkunde, the University of Kansas and Imperial College London have worked with the Natural History Museum and the UK’s Diamond Light Source to scan and examine the fossil in detail. We have known since 2008 that a group called the uraraneids were a sister group to true spiders – they could make silk, but probably laid it down in sheets, rather than spinning it as modern spiders do. They also had a tail-like structure at the end called a flagellum. Analysis of Idmonarachne brasieri suggests that as the spider lineage evolved, the animals lost their tail-like structure, and developed spider-like fangs and limbs. Whilst they could likely make silk, the ancestors lacked the ability to spin it using specialized appendages called spinnerets. These are the features that define true spiders, and give them more control over the use and distribution of silk. 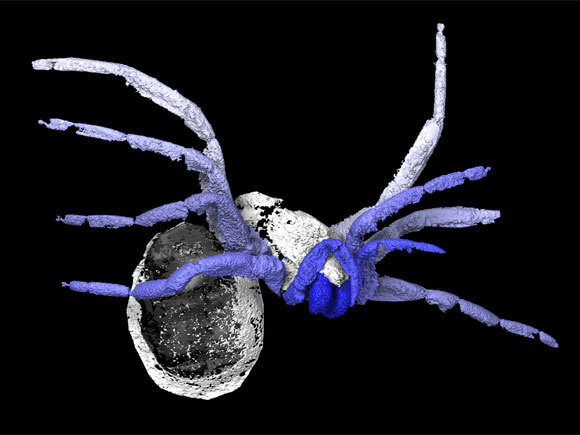 Be the first to comment on "Researchers Discover 305 Million-Year-Old “Early Spider” Fossil"